Beautiful certificate from the United Service Organizations. This historic document has an ornate border around it with a vignette of the logos of different United Service organizations. This item has the signatures of the Company’s President, State Chairman, and Council Chairman. 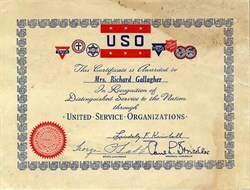 The certificate was issued to Richard Gallagher. Light water stain. The United Service Organizations Inc. (USO) is a private, nonprofit organization that provides morale and recreational services to members of the U.S. military, with programs in 140 centers worldwide. Since 1941, it has worked in partnership with the Department of Defense (DOD), and has provided support and entertainment to U.S. armed forces, relying heavily on private contributions and on funds, goods, and services from DOD. Although congressionally chartered, it is not a government agency.